Here are the photos that go with the previous post. 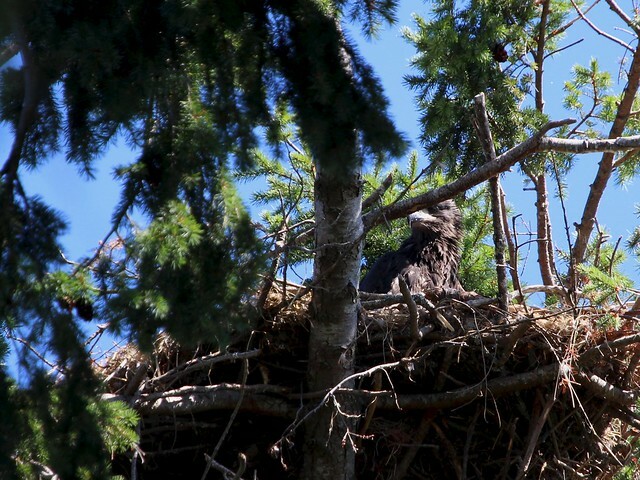 July 4, 10:18, eaglet on the nest. Here's one of the parents on one of the skinny perch trees near shore. Belly feathers fluffed out but right foot tucked in. Moving food into crop here, if I remember correctly. Foot still up, not on alert. Here's the other parent, on another skinny perch tree. ...Only to land again on the next perch. At 3:30 this afternoon I got a phone call from MARS. Someone had found an eagle near the Heron Rocks campsite. The eagle was in shallow water and I think they said they saw it coming to shore. They were able to get very close, so they knew that something was wrong. 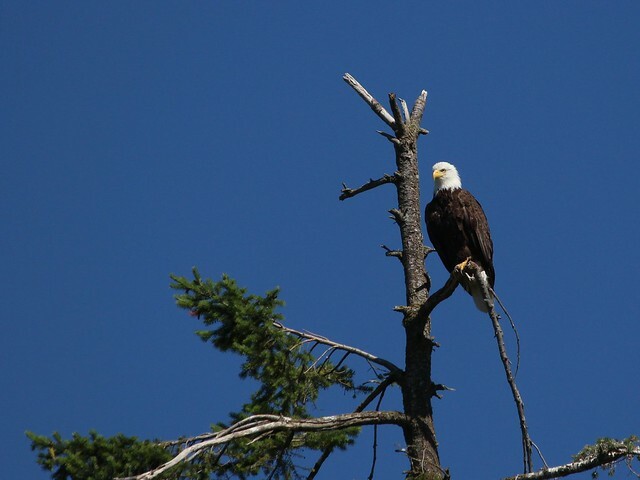 Now this very morning I paddled past this territory and heard one screep and one gulling call, so it sounds like the eagle family is still around. Did one of them, fishing, have an accident? I was hoping that by the time I got there, this eagle would have had a rest and then flown away. This is what I found, on the tidal flats between Toby Islet and the campsite. 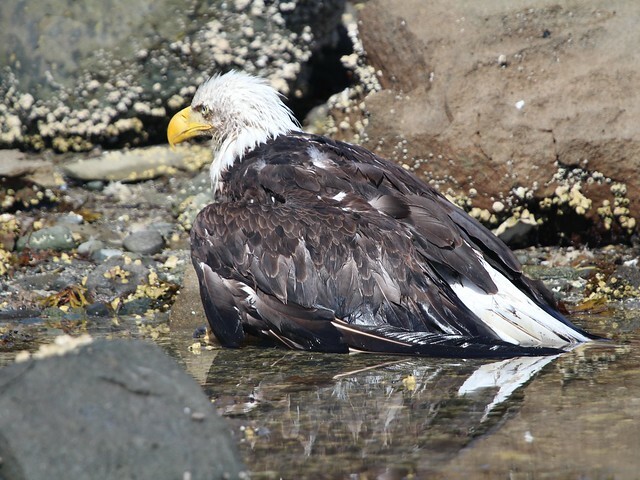 The family who made the discovery told me that the eagle had been walking around shore for a while, but here she was again. Not even moving with a whole family 50 feet away. Wings drooping... Left a bit more than right? We can see a bit of dark-brown spotting on the tail feathers. There was much more visible once the tail tip was out of the water. Also seemed like a gap in the middle of the tail, but whether from accident or normal moult I don't know. But anyway, this is a sub-adult, not one of the Heron Rocks adults as I had feared. Capture was heartbreakingly easy. This eagle was completely exhausted. I'm thinking a female though, because she was surprisingly heavy. I don't think the wet feathers would have made such a difference in heft. 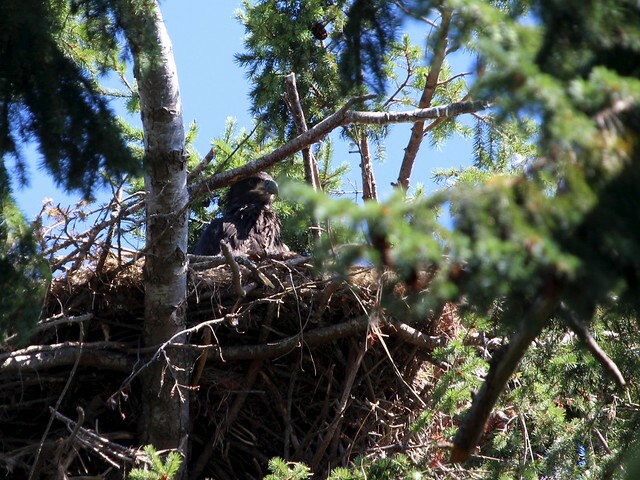 I'm hoping it means that this eagle started out healthy, as opposed to the slow decline and emaciation we often see. I am grateful to the family who found her and who helped carry equipment and gave me a hand for the capture. Also to the unsuspecting travellers who accepted to carry this strange cargo to Buckley Bay where the intern from MARS was going to meet them. I have not received any panicked phone calls so all must be well. And as usual I'm grateful to MARS. We couldn't do any of this without them. Oh Wren, I'm so glad you were able to help this poor eagle! Thanks for all you do! And thanks for being available to this eagle! This photo is from my morning outing. 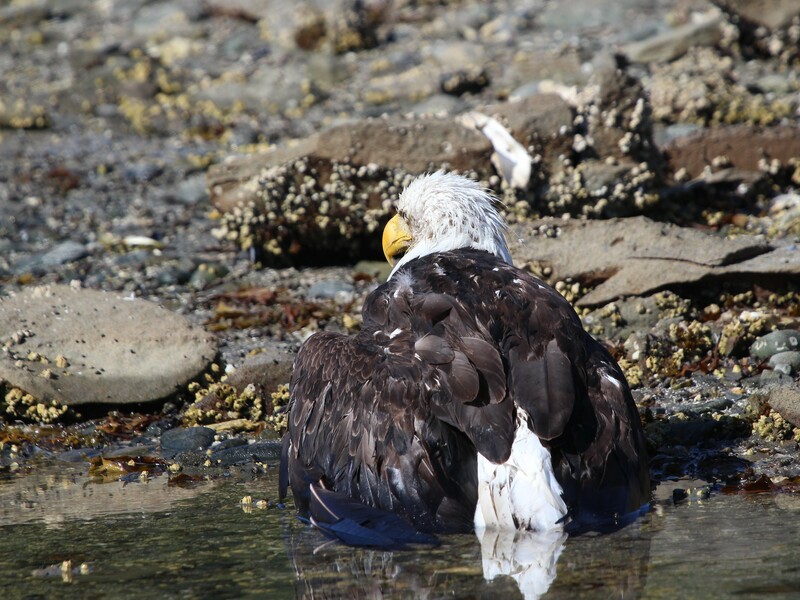 At least two eagles were attending the feed ball I saw south of Norris Rocks, about 1.5 km offshore from where we found the injured bird. 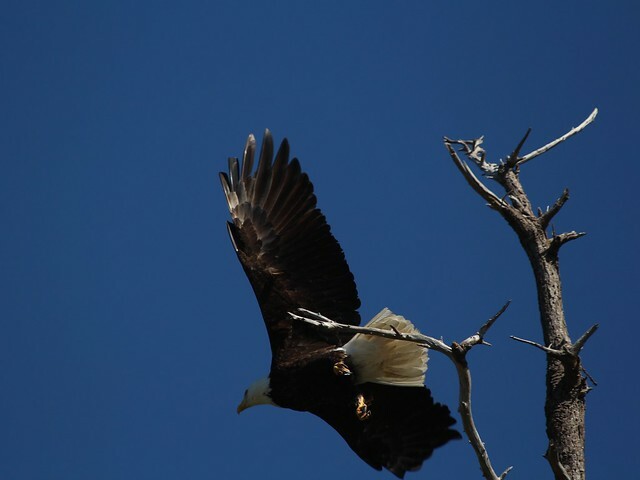 There may be a third eagle, diving straight down with his feet pointing up. 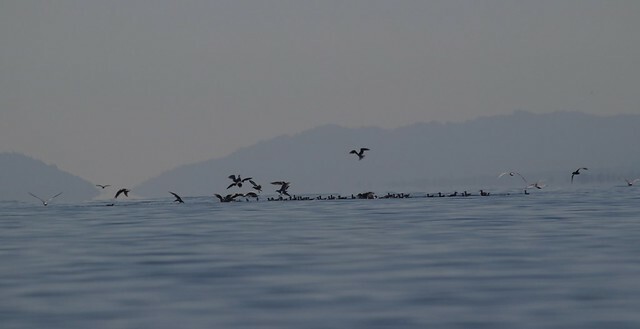 I wonder if our rescued eagle was among them? This is just incredible, the pictures, the story, and You, Wren. 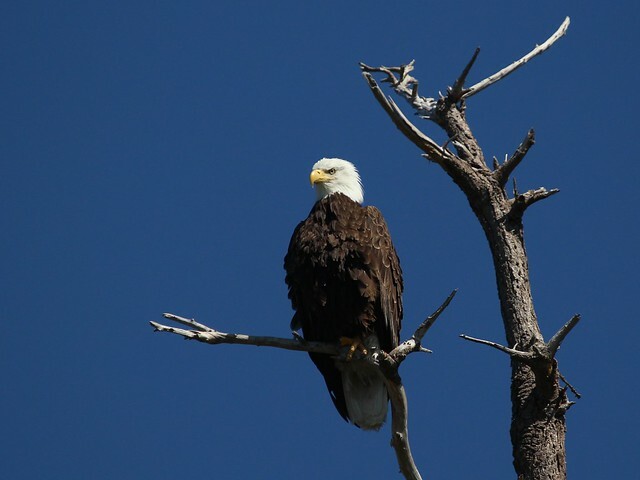 Thank you and Best Wishes to the Eagle. I got some news this morning from Booni, who had contacted MARS about yet another rescue. 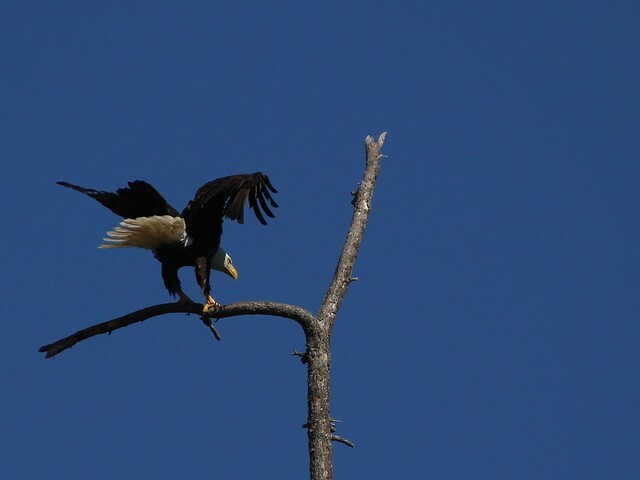 Unfortunately our beautiful sub-adult eagle did not make it. She died in transport, somewhere between Hornby and Buckley Bay. I could tell at the time of capture that she had absolutely no fight left in her, so I was saddened but not very surprised. I'm hoping that there might be time for a post-mortem exam that would tell us more about what happened to that mysterious eagle from the sea. I'm sorry she didn't make it, Wren. Thank you for letting us know. This morning I paddled past this nest again. 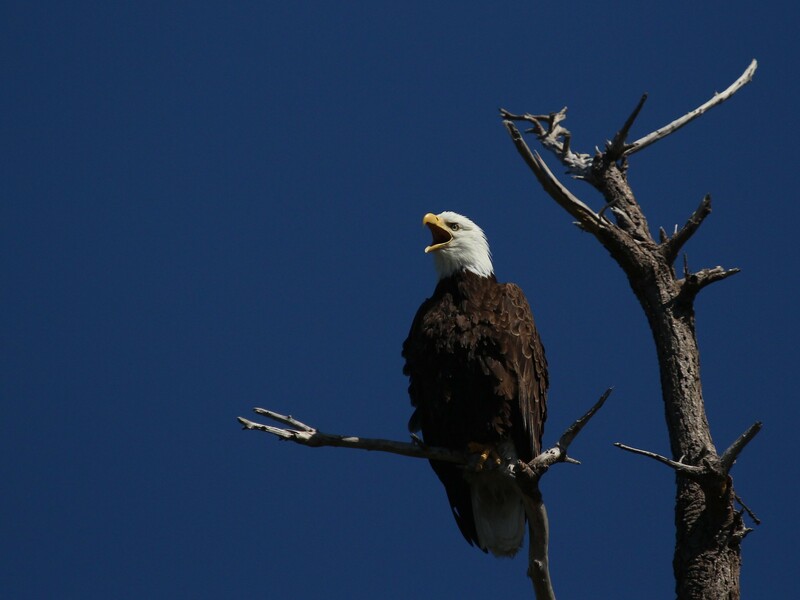 I saw one adult eagle perched on one of the Heron Rocks. On the return trip from Norris Rocks, an eaglet was flying over Toby Islet. So it looks like the Heron Rocks family has stayed rather late once again and the Niners aren't the only eagles left on the island. Awwww, Wren, I'm so sorry the rescue was for naught! You tried your best, and you must be glad you gave that eagle his/her best chance..... Thanks for the wonderful photo of the birds on the fish ball! Love feeling like I'm a bug on your shoulder when you go on your wanderings! Thank You for taking us all along with you!